Susy Ellison is the high school science teacher we all wish we’d had. With projects like designing and building an energy-efficient straw-bale classroom, installing solar panels on the school’s roof, and building a greenhouse (and growing things in it), Ellison is infusing her students with a strong sense of what she calls environmental literacy. 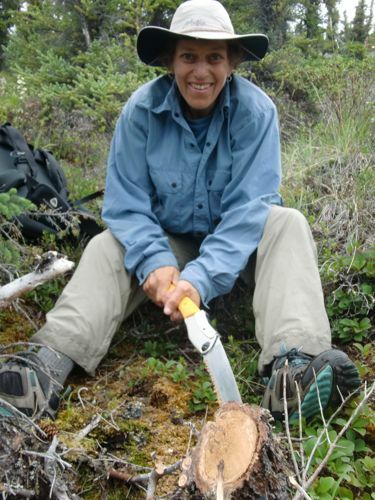 Now in her 15th year at Yampah Mountain High School in Glenwood Springs, Colorado, Ellison spent the summer with two teams of Alaskan researchers as a PolarTREC teacher, so this year’s class will, no doubt, be in for some fun and interesting science activities. Ellison’s love for Alaska goes back to graduate school when she spent time in Prudhoe Bay studying how arctic foxes interact with nesting shorebirds and small mammals. Her field experience served her well this year as she traveled to the Arctic National Wildlife Refuge for a six-day NSF-funded tree-ring study with Kevin Anchukaitis and Angie Allen (Lamont-Doherty Earth Observatory), and to the Raven Bluff Site for two weeks with Jeff Rasic (UAF/NPS), William Hedman (BLM), and Ian Buvit (Central Washington University) for a NSF-supported study on early human settlement in arctic Alaska. For the tree-ring study, field team members spent their time extracting straw-sized cores from standing white spruce trees in five sites spread over a few miles; Anchukaitis will compare annual growth rings from these cores with samples taken from fallen trees. By analyzing the thickness of annual rings, they will reconstruct North Slope climate and ultimately determine controls on the extent of arctic forest growth. Following a 10-day break exploring the Kenai Peninsula, Ellison joined Jeff Rasic’s team for a rainy and cool two week archaeological excavation near Kivalina. Despite the soggy weather, the group made the best of things and worked hard to maximize their field time. In addition to searching for artifacts in one-meter square pits started during the 2010 field season, Ellison participated in a soil survey and in reconnaissance flights wherein the group looked for new archaeological sites. Dressing for success at the Raven Bluff site. “We usually hear that the first people to North America came from Asia via the Bering Land Bridge and then headed south. The Raven site is about the same age, about 12,000 years old, as the Clovis culture sites farther south. At Raven we looked, in particular, for these fluted spear points so that they can be dated and compared to similar Clovis-age points. The idea is that people may have moved back and forth between Alaska and southern North America rather than unidirectionally,” says Ellison. Now that a new school year is underway, Ellison is thinking about ways to share her PolarTREC experiences with Yampah. So far, she’s considering having students look at tree rings to determine Colorado’s long-term fire history. She would also like to take a group backpacking in Utah to see some archaeological sites close to home while considering what clues they might leave behind for future archaeologists to find. Ellison’s school is run by the Mountain Board of Cooperative Educational Services, and serves students from four public school districts. The school serves as an alternative to students who have been unsuccessful in other area high schools for one reason or another.